A Business Rules Management System (BRMS) is a perfect complement to a Microservices Architecture. The reasons for implementing a BRMS are even more compelling in a Microservices Architecture. In this blog, I will discuss the reasons for using a Business Rules Management System (BRMS) in a Microservices Architecture and then explore a use case to demonstrate these benefits. Microservices Architecture is an approach to developing a single application as a suite of small services, each running in its own process and communicating with lightweight mechanisms called an API. These services are built around business capabilities and independently deployable by fully automated continuous integration/continuous delivery (CI/CD) pipelines. 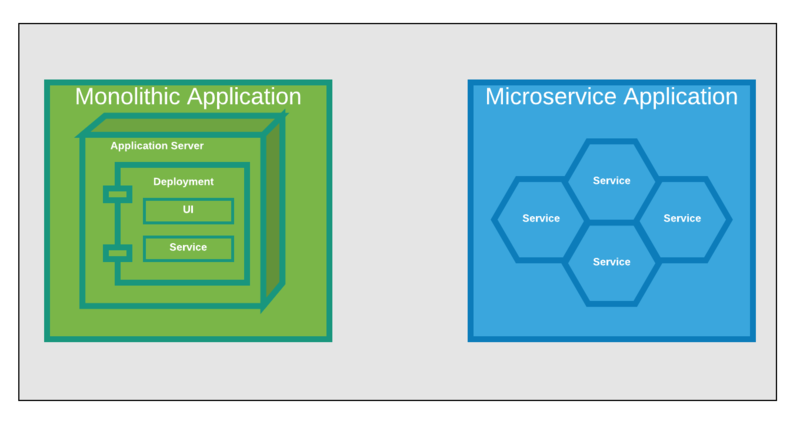 The following diagram illustrates the difference between a traditional Monolith Application and an Application using a Microservices Architecture. Software built as microservices can be broken down into multiple component services. These services can be deployed and redeployed without compromising the integrity of the entire application. Services can be independently scaled. If one microservice fails, the others will continue to work. Services are easier to modify and understand. New team members can become productive more quickly. Increased autonomy of individual development teams within an organization. Ideas can be implemented and deployed without having to coordinate with a wider IT delivery function. A Business Rules Management System is a software system used to define, deploy, execute, monitor and maintain the variety and complexity of decision logic that is used by operational systems within an organization or enterprise. This logic is referred to as business rules. Business Rules include policies, requirements, and conditional statements that are used to determine the actions that take place in applications and systems. Reduce or remove reliance on IT departments for changes in live systems. Note that QA and Rules testing will still be needed in any enterprise system. In a Microservices Archicture, Business Rules become Polyglot Microserivces that are incorporated in the Microservices Architecture. The autonomy of the rules services can reach deeper into the business because they are managed by the BRMS. 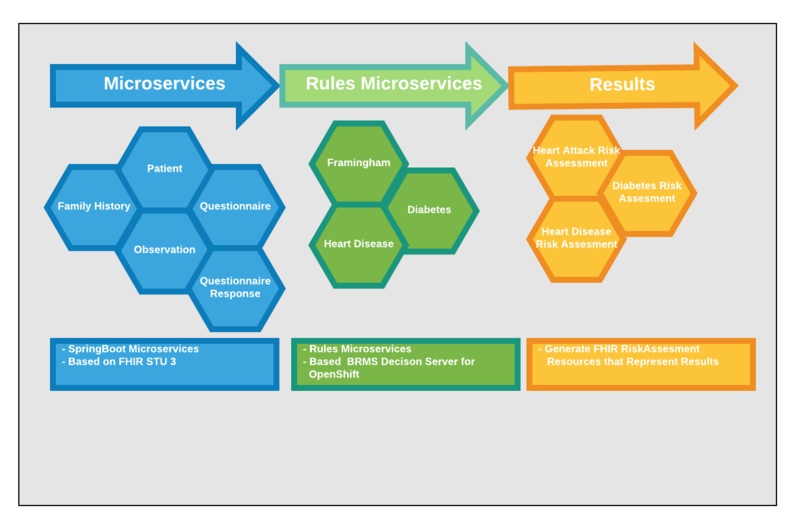 These rules services then gain the benefits from the Microservices Architecture. To demonstrate Business Rules in a Microservice Architecture, let's explore a use case from the healthcare industry. In this use case, we have a series of SpringBoot Microservices based on the FHIR STU 3 data structure standard. These services allow the input of Patient, Family History, Medical Observations and Questionnaires to gather information about a Patient's health. The Business Rules Management Platform is utilized to implement business rules to perform Risk Assessments for Heart Disease, Heart Attack and Diabetes based on the Patient's medical information. The following diagram illustrates the components of the FHIR Medical Repository Microservice Application. The code for the FHIR Microserivces and Business Rules is pushed to a Git Repository. 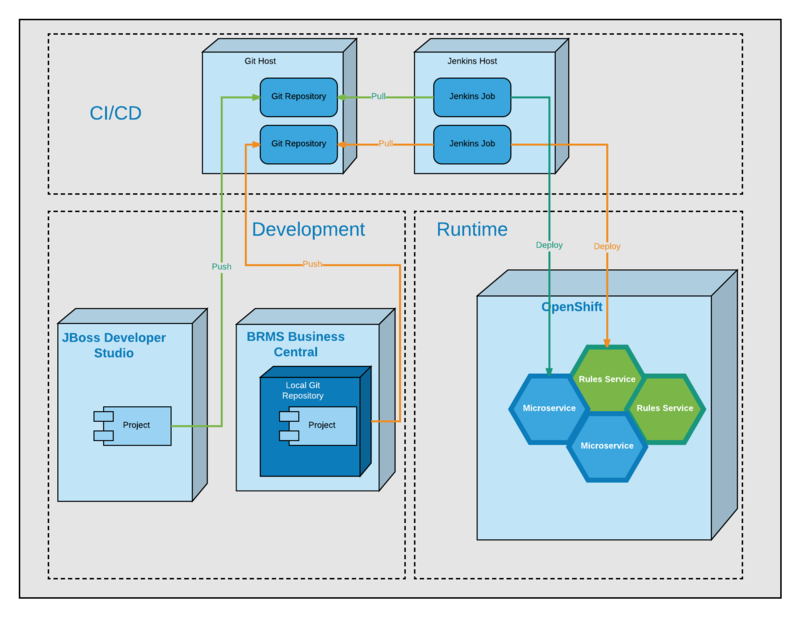 From there, a CI/CD process is followed to build, package and deploy the services on the OpenShift Container Platform. You can check out one of our recent webinars, viewable on-demand, detailing the FHIR Medical Repository Microservice Architecture Application here. The source code for the Microservices is located at https://github.com/Vizuri/openshift-fhir-rules-microservices. The source code for the business rules is located at https://github.com/Vizuri/openshift-fhir-rules-rules. If you'd like additional information, or to schedule a complimentary consultation please don't hesitate to contact us. Mr. Eudy is a Technical Director responsible for overseeing Service Oriented Architecture (SOA), Enterprise Integration and Java Enterprise Edition (JEE) practice areas. He has over 27 years of experience including 16 as a consultant. He has extensive experience in Enterprise, Application and Systems Architecture. He has led development efforts on these technologies for clients in various industry sectors such as retail, medical, government, and insurance.